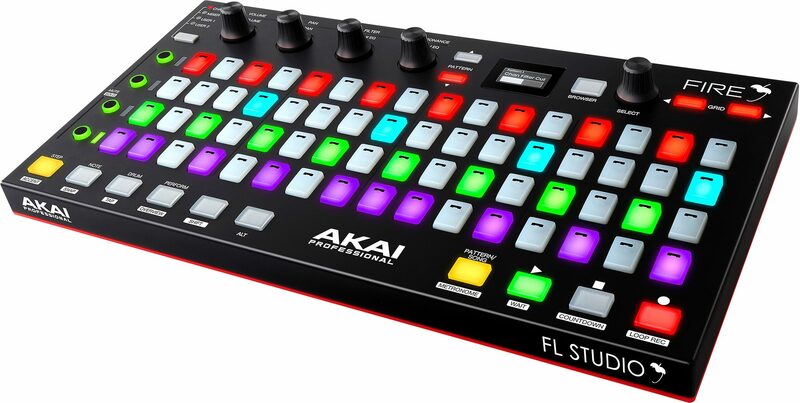 The Akai Pro Fire is a dedicated hardware controller for the FL Studio DAW platform. Created in close partnership with Image-Line, Fire is a high-performance tool designed to enhance the workflow and music-creating experience for all FL Studio producers. FL Studio Fruity Fire Edition is included, so you can get started right out of the box. Featuring plug-and-play integration, within seconds you'll be creating patterns and building tracks using Fire's 4x16 matrix. Instantly navigate the Channel Rack, Browser, Tool Bar and Playlist menus without the click of a mouse. The graphical OLED display makes for easy browsing and tactile control over the various files, menus and parameters within your FL Studio session. And the dedicated transport buttons give you full control of your music. When in Performance mode, Fire deftly blurs the lines between controller and instrument with its ability to play and record notes in time using the velocity-sensitive RGB pads. Up to four units can be connected to FL Studio at once, creating an 8x32 matrix for the ultimate Fire experience. Fire features a dedicated browser function to navigate, audition and load your audio samples, recall project files and open plugins. Simply select browser and use the Select rotary encoder to preview and load content and devices within FL Studio -- the graphical OLED display makes for easy browsing and controlling the various files, menus and parameters within your session a breeze. Featuring plug-and-play integration, within seconds you'll be creating patterns and building tracks using Fire's 4 x 16 velocity-sensitive RGB pad matrix, designed for immediate interaction with FL Studio's celebrated step sequencer. Get hands-on with your production with everything you need to control FL Studio's channels and patterns. With direct hardware control over your session, you can easily mute and solo channels, expand the grid matrix, select new channels, navigate through patterns and much more without touching a mouse. From searing synth leads to lush pads, Fire's Note mode provides the ultimate platform to add melody and harmony to your production. Simply push the Note button and Fire's RGB pads switch-up to a MIDI keyboard giving you four octaves of note data, perfect for playing all of your instruments hosted in FL Studio. Fire's pad matrix features an MPC-style 16-pad layout for seamless integration with FPC and SliceX. 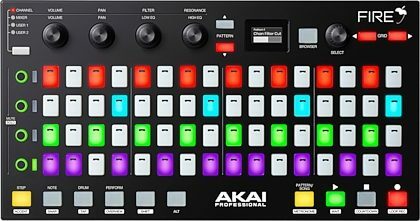 This is great for FL Studio producers who want a traditional beat-making experience or want to use their finger-drumming chops on the track. Whether you're a studio producer refining an arrangement or live performer looking to take your sessions to the stage, Fire's Performance mode provides the ideal platform to remix and reimagine your tracks. Simply select Performance mode and launch MIDI clips and audio directly from Fire's RGB pad matrix for a truly inspiring live production experience. Bringing a tactile, mouse-free mixing solution to the FL Studio environment, Fire includes 4 banks of 4 touch-capacitive knobs that enable the user to instantly see and adjust parameter values. Providing control over channel, mixer and user-assignable parameters, this enables a more intuitive and enjoyable workflow. From tweaking volume and pan within FL Studio's mixer to adjusting filter controls within the selected channel and recording automation, you'll spend less time clicking and more time executing. Enter the ground-breaking, high-powered workflow heard all over the charts with the FL Studio Fruity Fire Edition software, included with Fire. FL Studio is a complete software music production environment, the culmination of more than 20 years of innovative development. The software features everything you need in one package to compose, arrange, edit, mix and master professional quality music. With access to FL Studio's piano roll editor, step sequencer, playlist, VST instrument support, full automation functionality, plus 18+ virtual instruments and over a dozen built-in effects and processors, FL Studio Fruity Fire Edition provides the ultimate platform to spark that initial idea, ignite your creativity and complete your masterpiece – all in an ultra-intuitive, inspiring environment engineered to keep you tuned in to what's important -- your music. "A Must Have For FL Studio!" 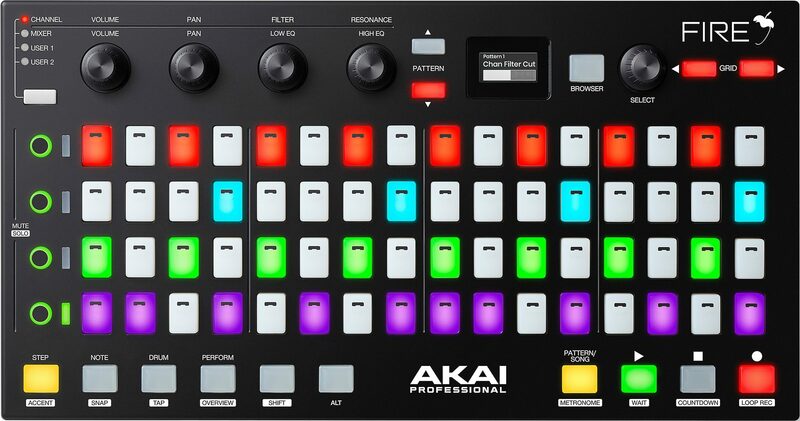 Overall: This controller is hands on forFL Studio! everything you need to make music is here with full hands on control. I have waited along time for a dedicated controller. Works great.